Mix cream, broth, and butter to make a gravy. Serve gravy over cooked turkey breast and prepared KetoVie Café Savory Stuffing. Thaw one donut and allow the butter and cream cheese to soften at room temperature. Crumble the donut or slice it into 3 equal slices. 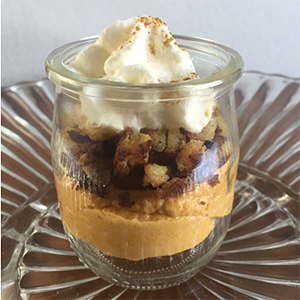 In a small zip top bag, combine the canned pumpkin, butter, cream cheese and Truvia. Zip the bag closed and squeeze the bag to combine all the ingredients. Snip the corner of the bag to squeeze out all of the puree. Sprinkle with the cinnamon and serve immediately. Tip: To lower the ratio, reduce the butter. *Use an Isi® Easy Whip for extra fast and easy whipped cream.